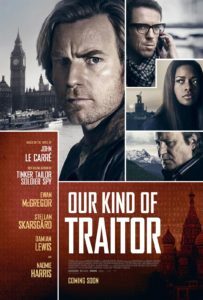 Based on a John Le Carre novel, Our Kind of Traitor, is a good British spy movie with multiple betrayals. Ewan McGregor is a professor of poetry who is asked by a Russian mafia finance guy, Stellan Skarsgard, to help him while he is on holiday in Marrakech and gets him involved in international dirty politics and business. Damien Lewis plays a frustrated MI6 agent who goes ahead with a mission to get the Russian and his family to London in exchange for information on British politicians and business people who have been paid off to allow a new bank to start a business in London. The beautiful opening ballet sequence does not reflect the content of the movie although it is shot in some beautiful locations. It’s not an action thriller, more of a mind game. Skarsgard is magnificent – whenever he’s on screen the movie comes to life – worth seeing though.